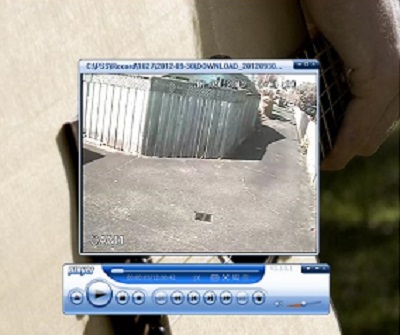 Learn how to download CCTV camera security video so you can give it to the Police, in this short video and the written instructions that follow it. 1. First follow the instructions on How To Watch Recorded Security Camera Video On Your Computer on page 2. 2. Then, once you’ve found the video you want, select the tick-box next to it. 5. You can save the video file wherever you want on your computer. It saves it in a format with a .dav file extension, which is pretty much useless to man or beast, so you need to convert it into a format that the Police can view. 6. To do this open the Player program. Our Installer should have left this icon on your desktop but if not click on the link just above and you can download it. 7. On the far left of the Player you’ll see an up arrow and when you hover your mouse over it you’ll see Open file. Click on that arrow and find the file you just saved, and open it by double clicking it. 8. Have a play with the controls of Player so you get a feel for it. When you’re ready to save your video in a format the Police can use, click on the AVI button. You can choose the Target File which is where the Player will save your .avi video file on your computer. 9. You can put the file onto a memory stick and hand it to the Police or even e-mail it to them. Whatever they want.